Using natural fibres, the Hound Glove is the best way to care for short haired breeds. Removes loose hair and stimulates healthy growth. Original LAWRENCE “Hound Gloves are specifically designed for Short Haired breeds, for both lifting dead hair and cleaning. Using 100% natural materials the sisal and horsehair gloves have a woven and cropped construction to enable the fibres to penetrate the coat. The natural fibres work like tiny individual combs, cleaning away dust and dirt. The stroking action of using the Hound Glove (view Animation) causes the dog's own glands to secrete oil which further enhance the appearance of the coat. 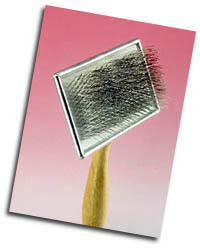 Some people prefer using a wire pin glove rather than a slicker brush, particularly when grooming larger dogs. 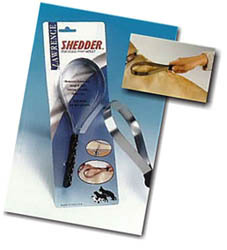 Wire and Wire/Hair gloves have a slicker type wire pin pad.These should be used on the medium length, denser coated breeds for larger dogs, like the Labrador Retriever, and depending on the coat texture the Corduroy or Horsehair on the reverse can be used to give an extra shine. Sisal is a naturally growing grass type plant, its dried fibres are fine and straight. When these are woven and cropped it produces a dense brush-pad which will penetrate the coat to clean and remove loose hair. 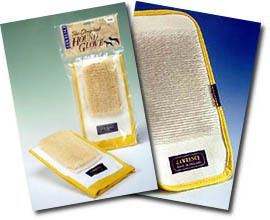 The sisal glove can be used wet or dry,so is ideal for after shampoo. 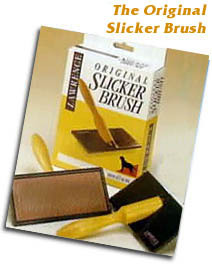 Woven from 100% natural horsehair, the soft cropped brush-pad is ideal for breeds with very fine short coats. These breeds do not generally need daily attention but regular use of a hair glove will keep the coat in tip-top condition.